Compost tumblers are a great idea: instead of having to turn your compost by hand, a tumbler lets you just give it a spin, and it all gets mixed and tossed like a salad. Tossing it frequently like this speeds up the composting process. But not all tumblers are the same. The problem with most of them is that they are just too big. Compost is very heavy. It takes a lot of force to rotate a 55 gallon (or bigger!) drum that is half full of wet compost, sitting high off the ground on a shaky stand. A Dual-Batch Compost Tumbler solves two problems. First, because they are split, each chamber is light enough to be easy to turn, but because there are two you can still make plenty of compost. Second, when one side is full you can stop adding stuff to it so it can fully break down, while you start use the other side as the active bin. It's an ingenious design! 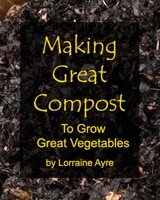 Complete instructions on making compost that doesn't smell, no matter what bin you use. Learn how to balance ingredients for speedy, odor-free compost. Learn about the advantages and disadvantages of different types of compost bins, so you can pick the one that will work best for you. What compost does and why it is so important for a healthy, vibrant garden. How to make actively-aerated compost tea for boosting disease resistance in the garden.